SATS offers a like-clockwork, 24x7 Remote Database Administration (rDBA) service that can reduce up to 80% IT cost by optimizing database uptime and performance. SATS contracts are individually tailored for meet each client's specific goals and environments. SATS offers three basic types of services: complete, stand-by, and emergency support. All services use the same proven operational practices, noninvasive technology, and a customizable notification system. The service tiers vary in their extent of the coverage and the distribution of DBA tasks between SATS and a business' in-house team. Your business will work with SATS' Bay Area team of experts dedicated to your specific business needs. SATS rDBA provides 3-tier support, one point of contact, comprehensive up-to-the-minute reporting, and one of the best emergency response assistance in the industry. SATS' DBAs work 24x7 on resolving latent and routine problems that can affect the performance of a database. Cerberus Remote DBA agent requires no openings through your firewalls (Electronic Signature Act compliant). Cerberus gathers and analyzes raw performance data for latent and immediate problems, forecasts behavioral trends, and supports capacity and maintenance planning. Cerberus does not require any firewall openings and is Electronic Signature Act compliant. It can gather and analyze raw performance data for latent and immediate problems, forecast behavioral trends, and support capacity and maintenance planning. The gathered data is optionally encrypted upon transmission, analyzed, and then made available to authorized users on the designated site. SATS' rDBA service supports the following backend services and devices. Monitoring runs on all O/S and hardware platforms, including Solaris, Linux, Windows, Irix, HPUX, True64, AIX and others. Monitoring of specific areas: MemSQL clusters, Oracle partitions, RAC, Stand-by databases, Oracle Streams, MS SQL mirroring and replication and many others. The following are every-day tasks which are packaged into SATS' Remote DBA service. 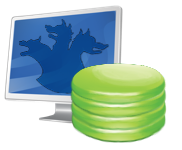 Using Cerberus, SATS' rDBA service is currently maintaining 1,865 active databases & instances in its client pool. Each account is assigned to a team of three DBAs: one Account Manager and two support members. Each group member has a major and minor area of expertise (i.e. an Oracle expert with MySQL as a secondary skill), creating a blended, resourceful team. View a detailed video on SATS' rDBA services and how they work. All service agreements clearly communicate our responsibilities and include alert response procedures, on-going communication with your internal groups, reporting, customization, and pricing. For quote please contact SATS RDBA Services. View generic pricing information here.